If you feel that you want to help please email or phone me. 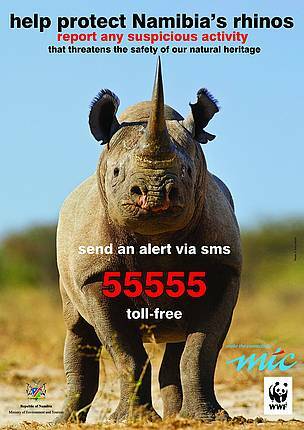 Every small donation counts and WILL be used in rhino protection. Please let as many people as you can know about the rhino's plight, if only to make them aware of the undoing of one of the greatest conservation success stories of the last century right before our eyes. Thanks and I hope to hear from you. 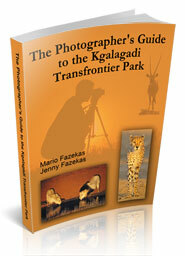 We are offering a 30% discount on the The Photographer's Guide to the Pilanesberg National Park eBook. 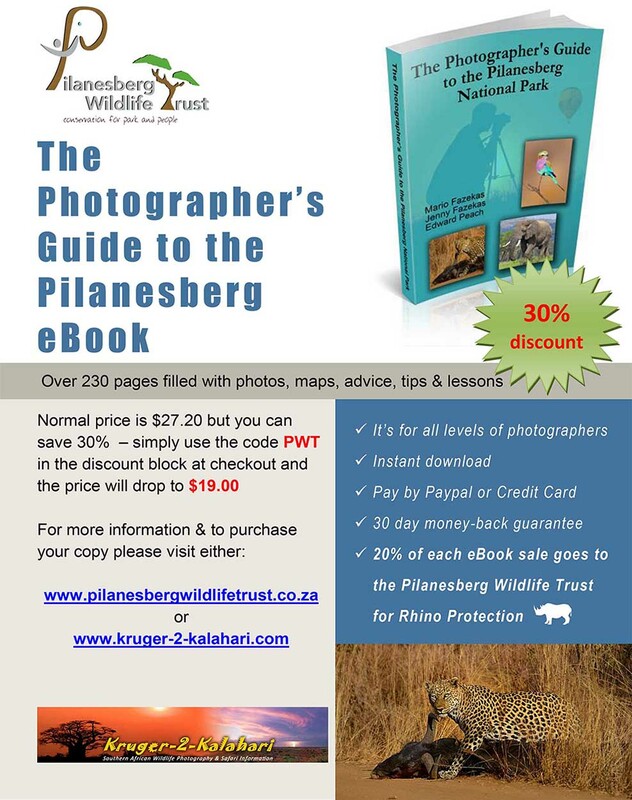 In addition, we will be giving a further 20% sales of the eBook to the Pilanesberg Wildlife Trust (PWT) for Rhino protection, as this has become the PWT's primary conservation project in Pilanesberg until they can stop this awful situation. In an attempt to halt this slaughter in Pilanesberg, the PWT has embarked on several fund raising campaigns to equip the Anti Poaching unit with much needed equipment. Currently the main aim is to raise enough funds to purchase suitable vehicles for the park to conduct enough patrols in the remote parts of the park. Once again the Pilanesberg Wildlife Trust humbly requests any assistance in trying to curb the growing rhino poaching epidemic ravaging South Africa. 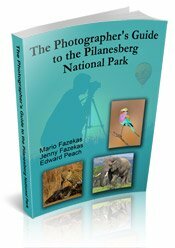 Please visit the website of the Pilanesberg Wildlife Trust for more information on the various poached rhinos and what the PWT'S challenges are. There is nothing more distressing for a conservationist than finding a dead rhino with horns removed! 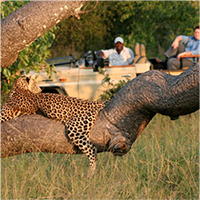 In August 2011 we spent two weeks on safari in Etosha with some wonderful sightings. 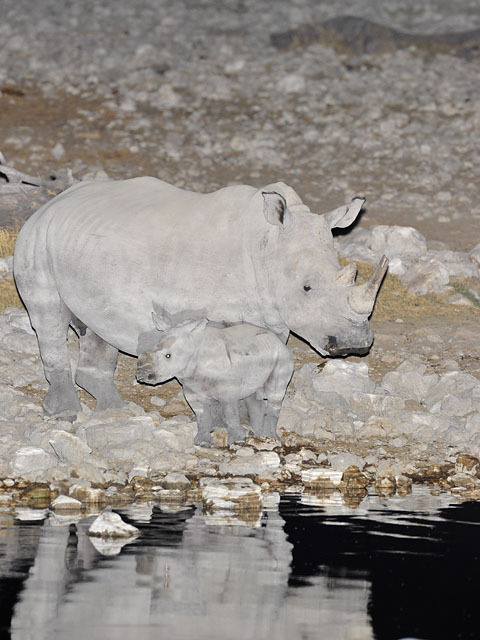 The first poached rhino (a white rhino) was found outside of Etosha but they have realised that the poaching threat is fast bearing down on Etosha as well. Namibia has the largest population of black rhinos in the world and it is Namibia's flagship species but it's only a matter of time before the poachers focus on these rhinos. 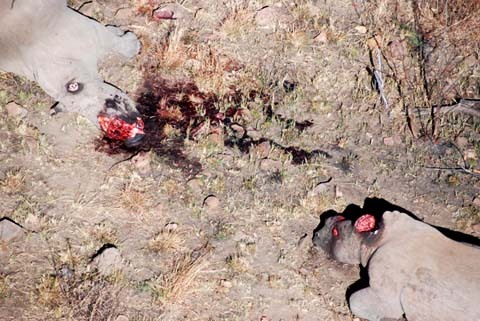 If the poachers get hold of them, they will shoot the mother, cut off her horns and leave the baby to fend for itself. Real nice people! I sincerely hope that Namibia is prepared for the rhino poaching onslaught that South Africa is currently enduring as whatever happens in South Africa tends to spill over into neighboring countries, sooner or later. In 2014 Namibia lost 24 rhinos to poachers and so far this year (June 2015), 60 rhino carcasses have been discovered, mainly in Etosha. 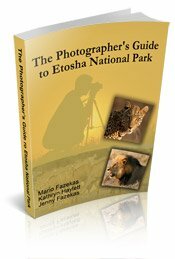 We spent just 3 days in western Etosha during March 2015 and we saw one white rhino carcass at the Dolomite Camp waterhole (the authorities had cordoned the area off and were investigating the crime scene) and a very sick-looking black rhino at Klippan waterhole - it was just standing looking at us with spit dribbling from its mouth - it was most probably poisoned.